For the latest updates, see Opportunity mission timeline. Opportunity, also known as MER-B (Mars Exploration Rover – B) or MER-1, and nicknamed "Oppy", is a robotic rover that was active on Mars from 2004 to late 2018. Launched on July 7, 2003, as part of NASA's Mars Exploration Rover program, it landed in Meridiani Planum on January 25, 2004, three weeks after its twin Spirit (MER-A) touched down on the other side of the planet. With a planned 90-sol duration of activity (slightly more than 90 Earth days), Spirit functioned until it got stuck in 2009 and ceased communications in 2010, while Opportunity was able to stay operational for 5111 sols after landing, maintaining its power and key systems through continual recharging of its batteries using solar power, and hibernating during events such as dust storms to save power. This careful operation allowed Opportunity to exceed its operating plan by 14 years, 46 days (in Earth time), 55 times its designed lifespan. By June 10, 2018, when it last contacted NASA, the rover had traveled a distance of 45.16 kilometers (28.06 miles). An artist's portrayal of Opportunity on the surface of Mars. Mission highlights included the initial 90-sol mission, finding extramartian meteorites such as Heat Shield Rock (Meridiani Planum meteorite), and over two years of exploring and studying Victoria crater. The rover survived moderate dust storms and in 2011 reached Endeavour crater, which has been described as a "second landing site". The Opportunity mission is considered one of NASA's most successful ventures. Due to the planetary 2018 dust storm on Mars, Opportunity ceased communications on June 10 and entered hibernation on June 12, 2018. It was hoped it would reboot once the weather cleared, but it did not, suggesting either a catastrophic failure or that a layer of dust had covered its solar panels. NASA hoped to re-establish contact with the rover, citing a windy period that could potentially clean off its solar panels. On February 13, 2019, NASA officials declared that the Opportunity mission was complete, after the spacecraft had failed to respond to over 1,000 signals sent since August 2018. Collectively, the Opportunity and Spirit rovers were part of the Mars Exploration Rover program in the long-term Mars Exploration Program. The Mars Exploration Program's four principal goals were to determine if the potential for life exists on Mars (in particular, whether recoverable water may be found on Mars), to characterize the Mars climate and its geology, and then to prepare for a potential human mission to Mars. The Mars Exploration Rovers were to travel across the Martian surface and perform periodic geologic analyses to determine if water ever existed on Mars as well as the types of minerals available, as well as to corroborate data taken by the Mars Reconnaissance Orbiter.Spirit and Opportunity were launched a month apart, on June 10 and July 7, 2003, and both reached the Martian surface by January 2004. Both rovers were designed with an expected 90 sols (92 Earth days) lifetime, but each lasted much longer than expected. Spirit's mission lasted 20 times longer than its expected lifetime, and its mission was declared ended on May 25, 2011, after it got stuck in soft soil and expended its power reserves trying to free itself. Opportunity lasted 55 times longer than its 90 sol planned lifetime, operating for 5498 days from landing to mission end. An archive of weekly updates on the rover's status can be found at the Opportunity Update Archive. From its initial landing, by chance, into an impact crater amidst an otherwise generally flat plain, Opportunity successfully investigated soil and rock samples and took panoramic photos of its landing site. Its sampling allowed NASA scientists to make hypotheses concerning the presence of hematite and past presence of water on the surface of Mars. Following this, it was directed to travel across the surface of Mars to investigate another crater site, Endurance crater, which it investigated from June to December 2004. Subsequently, Opportunity examined the impact site of its own heat shield and discovered an intact meteorite, now known as Heat Shield Rock, on the surface of Mars. From late April to early June 2005, Opportunity was perilously lodged in a sand dune, with several wheels buried in the sand. Over a six-week period, Earth-based physical simulations were performed to decide how best to extract the rover from its position without risking its permanent immobilization. Successful maneuvering a few centimeters at a time eventually freed the rover, which resumed its travels. Opportunity was directed to proceed in a southerly direction to Erebus crater, a large, shallow, partially buried crater and a stopover on the way south towards Victoria crater, between October 2005 and March 2006. It experienced some mechanical problems with its robotic arm. In late September 2006, Opportunity reached Victoria crater and explored along the rim in a clockwise direction. In June 2007 it returned to Duck Bay, its original arrival point; in September 2007 it entered the crater to begin a detailed study. In August 2008, Opportunity left Victoria crater for Endeavour crater, which it reached on August 9, 2011. Here at the rim of the Endeavour crater, the rover moved around a geographic feature named Cape York. 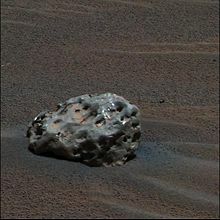 The Mars Reconnaissance Orbiter had detected phyllosilicates there, and the rover analyzed the rocks with its instruments to check this sighting on the ground. This structure was analyzed in depth until summer 2013. In May 2013 the rover was heading south to a hill named Solander Point. Opportunity's total odometry by June 10, 2018 (sol 5111), was 45.16 km (28.06 mi), while the dust factor was 10.8. Since January 2013, the solar array dust factor (one of the determinants of solar power production) varied from a relatively dusty 0.467 on December 5, 2013 (sol 3507), to a relatively clean 0.964 on May 13, 2014 (sol 3662). In December 2014, NASA reported that Opportunity was suffering from "amnesia" events in which the rover failed to write data, e.g. telemetry information, to non-volatile memory. The hardware failure was believed to be due to an age-related fault in one of the rover's seven memory banks. 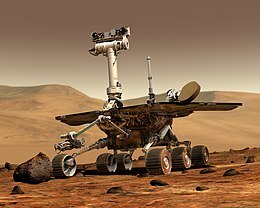 As a result, NASA had aimed to force the rover's software to ignore the failed memory bank; amnesia events continued to occur, however, which eventually resulted in vehicle resets. [clarification needed] In light of this, on Sol 4027 (May 23, 2015), the rover was configured to operate in RAM-only mode, completely avoiding the use of non-volatile memory for storage. 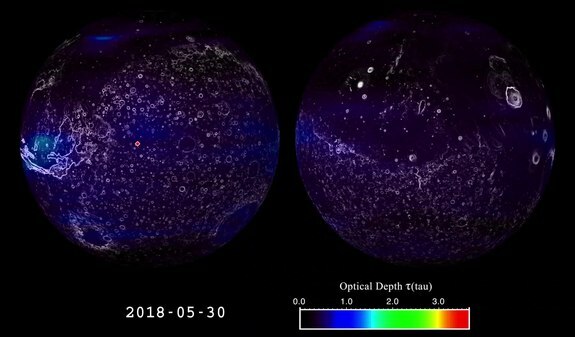 In early June 2018, a large planetary-scale dust storm developed, and within a few days the rover's solar panels were not generating enough power to maintain communications, with the last contact on June 10, 2018. NASA stated that they did not expect to resume communication until after the storm subsided, but the rover kept silent even after the storm ended in early October, suggesting either a catastrophic failure or a layer of dust covering its solar panels. The team remained hopeful that a windy period between November 2018 and January 2019 might clear the dust from its solar panels, as had happened before. Wind was detected nearby on January 8, and on January 26 the mission team announced a plan to begin broadcasting a new set of commands to the rover in case its radio receiver failed. On February 12, 2019, past and present members of the mission team gathered in JPL's Space Flight Operations Facility to watch final commands being transmitted to Opportunity via the 70 meter dish of the Goldstone Deep Space Communications Complex in California. Following 25 minutes of transmission of the final 4 sets of commands, communication attempts with the rover were handed off to Canberra, Australia. More than 835 recovery commands were transmitted since losing signal in June 2018 to the end of January 2019 with over 1000 recovery commands transmitted before February 13, 2019. NASA officials held a press conference on February 13 to declare an official end to the mission. NASA associate administrator Thomas Zurbuchen said, "It is therefore that I am standing here with a deep sense of appreciation and gratitude that I declare the Opportunity mission is complete." As NASA ended their attempts to contact the rover, the last data sent was the song "I'll Be Seeing You" performed by Billie Holiday. The final communication from the rover came on June 10, 2018 (sol 5111) from Perseverance Valley, and indicated a solar array energy of 22 Wh, and the highest atmospheric opacity (tau) ever measured on Mars: 10.8. Search for and characterize a variety of rocks and soils that hold clues to past water activity. In particular, samples sought include those that have minerals deposited by water-related processes such as precipitation, evaporation, sedimentary cementation or hydrothermal activity. Determine the distribution and composition of minerals, rocks, and soils surrounding the landing sites. Determine what geologic processes have shaped the local terrain and influenced the chemistry. Such processes could include water or wind erosion, sedimentation, hydrothermal mechanisms, volcanism, and cratering. Perform calibration and validation of surface observations made by Mars Reconnaissance Orbiter instruments. This will help determine the accuracy and effectiveness of various instruments that survey Martian geology from orbit. Search for iron-containing minerals, identify and quantify relative amounts of specific mineral types that contain water or were formed in water, such as iron-bearing carbonates. Characterize the mineralogy and textures of rocks and soils and determine the processes that created them. Search for geological clues to the environmental conditions that existed when liquid water was present. Assess whether those environments were conducive to life. During the next two decades, NASA will continue to conduct missions with other spacecraft to address whether life ever arose on Mars. The search begins with determining whether the Martian environment was ever suitable for life. Life, as we understand it, requires water, so the history of water on Mars is critical to finding out if the Martian environment was ever conducive to life. Although the Mars Exploration Rovers did not have the ability to detect life directly, they offered very important information on the habitability of the environment in the planet's history. Spirit and Opportunity are twin rovers, each a six-wheeled, solar-powered robot standing 1.5 meters (4.9 ft) high, 2.3 meters (7.5 ft) wide, and 1.6 meters (5.2 ft) long and weighing 180 kilograms (400 lb). Six wheels on a rocker-bogie system enable mobility. Each wheel has its own motor, the vehicle is steered at front and rear and was designed to operate safely at tilts of up to 30 degrees. Maximum speed is 5 centimeters per second (2.0 in/s) although average speed was about a fifth of this (0.89 centimeters per second (0.35 in/s)). Both Spirit and Opportunity have pieces of the fallen World Trade Center's metal on them that were "turned into shields to protect cables on the drilling mechanisms". Solar arrays generate about 140 watts for up to fourteen hours per sol, while rechargeable lithium ion batteries stored energy for use at night. Opportunity's onboard computer uses a 20 MHz RAD6000 CPU with 128 MB of DRAM, 3 MB of EEPROM, and 256 MB of flash memory. The rover's operating temperature ranges from −40 to +40 °C (−40 to 104 °F) and radioisotope heaters provide a base level of heating, assisted by electrical heaters when necessary. A gold film and a layer of silica aerogel provides insulation. Communications depend on an omnidirectional low-gain antenna communicating at a low data rate and a steerable high-gain antenna, both in direct contact with Earth. A low gain antenna is also used to relay data to spacecraft orbiting Mars. Panoramic Camera (Pancam) – examines the texture, color, mineralogy, and structure of the local terrain. Navigation Camera (Navcam) – monochrome with a higher field of view but lower resolution, for navigation and driving. Miniature Thermal Emission Spectrometer (Mini-TES) – identifies promising rocks and soils for closer examination, and determines the processes that formed them. Hazcams, two B&W cameras with 120 degree field of view, that provide additional data about the rover's surroundings. Mössbauer spectrometer (MB) MIMOS II – used for close-up investigations of the mineralogy of iron-bearing rocks and soils. Alpha particle X-ray spectrometer (APXS) – close-up analysis of the abundances of elements that make up rocks and soils. Microscopic Imager (MI) – obtains close-up, high-resolution images of rocks and soils. Rock Abrasion Tool (RAT) – exposes fresh material for examination by instruments on board. The cameras produce 1024-pixel by 1024-pixel images, the data is compressed with ICER, stored, and transmitted later. The rover's name was chosen through a NASA sponsored student essay competition. Opportunity was 'driven' by several operators throughout its mission, including JPL roboticist Vandi Verma who also cowrote the PLEXIL command language used in its software. The rover uses a combination of solar cells and a rechargeable chemical battery. This class of rover has two rechargeable lithium batteries, each composed of 8 cells with 8 amp-hour capacity. At the start of the mission the solar panels could provide up to around 900 watt-hours (Wh) to recharge the battery and power system in one Sol, but this could vary due to a variety of factors. In Eagle crater the cells were producing about 840 Wh, but by Sol 319 in December 2004, it had dropped to 730 Wh. Like Earth, Mars has seasonal variations that reduce sunlight during winter. However, since the Martian year is longer than that of the Earth, the seasons fully rotate roughly once every 2 Earth years. By 2016, MER-B had endured seven Martian winters, during which times power levels drop which can mean the rover avoids doing activities that use a lot of power. During its first winter power levels dropped to under 300 Wh per day for two months, but some later winters were not as bad. Another factor that can reduce received power is dust in the atmosphere, especially dust storms. Dust storms have occurred quite frequently when Mars is closest to the Sun. Global dust storms in 2007 reduced power levels for Opportunity and Spirit so much they could only run for a few minutes each day. Due to the 2018 dust storms on Mars, Opportunity entered hibernation mode on June 12, but it remained silent after the storm subsided in early October. Opportunity's launch was managed by NASA's Launch Services Program. This was the first launch of the Delta II Heavy. The launch period went from June 25 to July 15, 2003. The first launch attempt occurred on June 28, 2003, but the spacecraft launched nine days later on July 7, 2003, due to delays for range safety and winds, then later to replace items on the rocket (insulation and a battery). Each day had two instantaneous launch opportunities. On the day of launch, the launch was delayed to the second opportunity (11:18 p.m. EDT) in order to fix a valve. Mars Global Surveyor orbiter's photograph of landing site showing "hole in one." (See also: simulation of Opportunity's trajectory on arrival at Mars in January 2004). On January 25, 2004, the airbag-protected landing craft settled onto the surface of Mars in the Eagle crater. In late December 2004, Opportunity reached the impact site of its heat shield, and took a panorama around Sol 325. Opportunity has provided substantial evidence in support of the mission's primary scientific goals: to search for and characterize a wide range of rocks and soils that hold clues to past water activity on Mars. In addition to investigating the water, Opportunity has also obtained astronomical observations and atmospheric data. Honoring Opportunity's great contribution to the exploration of Mars, an asteroid was named Opportunity: 39382 Opportunity. The name was proposed by Ingrid van Houten-Groeneveld who, along with Cornelis Johannes van Houten and Tom Gehrels, discovered the asteroid on September 24, 1960. Opportunity's lander is Challenger Memorial Station. On July 28, 2014, it was announced that Opportunity, having traversed over 40 km (25 mi), had become the rover achieving the longest off-world distance, surpassing the previous record of 39 km (24 mi) on the Moon by Lunokhod 2. On March 24, 2015, NASA celebrated Opportunity having traveled the distance of a marathon race, 42.195 kilometers (26.219 mi), from the start of Opportunity's landing and traveling on Mars. In March 2016, while trying to reach target on the slope of Marathon Valley in Cape Tribulation, the Mars rover attained a slope of 32 degrees, the highest angle yet for the rover since its mission began. This was so steep that dust that had accumulated on its top panels began to flow downward. Opportunity's view from the top of Cape Tribulation on the rim of Endeavour Crater, January 22, 2015. On Sol 3894 (January 6, 2015), Opportunity reached the summit of "Cape Tribulation," which is 443 feet (135 m) above "Botany Bay" level and the highest point yet reached by the rover on western rim of Endeavour Crater according to NASA. The rover could take pictures with its different cameras, but only the PanCam camera had the ability to photograph a scene with different color filters. The panorama views are usually built up from PanCam images. By February 3, 2018, Opportunity had returned 224,642 pictures. Panorama taken on the rim of Erebus crater. The rover's solar panels are seen on the lower half (December 5, 2005). Panorama of Spirit of St. Louis crater, a shallow crater about 34 meters (110 ft) long and 24 meters (80 ft) across. In its center is Lindbergh Mound, about 2 to 3 meters (6 to 10 ft) high. (annotated; false color; May 2015). Final panorama image taken by Opportunity between May and June 2018 prior to being disabled by the dust storms. "Blueberries" (hematite spheres) on a rocky outcrop at Eagle Crater. Note the merged triplet in the upper left. "Newberries": This view displays an area about 6 centimeters across. 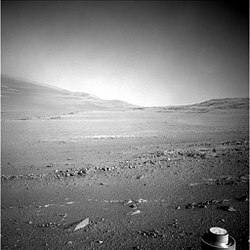 It was taken at an outcrop named "Kirkwood" at the Cape York on the rim of Endeavour crater on Mars. The spheres seen here are about 3 millimeters in diameter. The Microscopic Imager took this image at the 3064 sol. Opportunity (circled) as seen by HiRISE on January 29, 2009. Endeavour Crater is 17 km (11 mi) away. This map, color-coded for minerals (CRISM) and annotated, shows the rover's traverse up to about 2010 with some nearby features noted. Opportunity's traverse on Cape York from Sol 2678 to Sol 3317 with some additional annotations of the main features. With word on February 12, 2019, that NASA was likely to conclude the Opportunity mission, many media outsides and commentators issued statements praising the mission's success and stating their goodbyes to the rover. One journalist, Jacob Margolis, tweeted his translation of the last data transmission sent by Opportunity on June 10, 2018, as "My battery is low and it’s getting dark". The phrase struck a chord with the public mind and became widely reported, including some news reports that mistakenly asserted that the rover sent that English message, inundating NASA with additional questions. Margolis wrote a clarifying article on February 16, making it clear he had taken statements from NASA officials who were interpreting the data sent by Opportunity, both on the state of its low power and Mars's high atmospheric opacity, and rephrased them in a poetic manner, never to imply the rover had sent the specific words. ^ a b c "Launch Event Details – When did the Rovers Launch?". Archived from the original on February 18, 2009. Retrieved April 25, 2009. ^ a b c Nelson, Jon. "Mars Exploration Rover – Opportunity". NASA. Archived from the original on January 24, 2014. Retrieved February 2, 2014. ^ "Mars Exploration Rover project, NASA/JPL document NSS ISDC 2001 27/05/2001" (PDF). p. 5. Archived from the original (PDF) on May 27, 2010. Retrieved April 28, 2009. ^ McDowell, Jonathan (July 15, 2003). "Jonathan's Space Report No. 504". Jonathan's Space Report. Archived from the original on August 26, 2009. Retrieved April 28, 2009. ^ a b c Agle, D.C.; Brown, Dwayne; Wendel, JoAnna (February 13, 2019). "NASA's Opportunity Rover Mission on Mars Comes to End". NASA. Retrieved February 14, 2019. ^ Staff. "Mapping the Mars Rovers' Landing Sites". Esri. Archived from the original on May 4, 2014. Retrieved May 4, 2014. ^ a b "Mars Exploration Rover Mission: All Opportunity Updates". nasa.gov. Archived from the original on August 30, 2015. Retrieved September 18, 2018. ^ "Opportunity Memories | NASA Jet Propulsion Laboratory". www.jpl.nasa.gov. Retrieved February 14, 2019. ^ Spirit landed on January 4, 2004. ^ Malik, T. (June 21, 2018). "Mars Dust Storm 2018: How It Grew & What It Means for the Opportunity Rover". space.com. Future.plc. Retrieved February 14, 2019. ^ Rayl, A.J.S. (August 1, 2018). "The Mars Exploration Rovers Update: Dust Storm Wanes, Opportunity Sleeps, Team Prepares Recovery Strategy". planetary.org. Planetary Society. Retrieved February 14, 2019. ^ "Opportunity on verge of new discovery". wustl.edu. Archived from the original on September 24, 2011. Retrieved September 17, 2011. ^ Amos, Jonathan (February 13, 2019). "Nasa calls time on silent Opportunity Mars rover". BBC. Retrieved February 14, 2019. ^ Greicius, Tony (September 24, 2018). "Opportunity Emerges in a Dusty Picture". NASA. Archived from the original on October 15, 2018. Retrieved November 30, 2018. ^ Greicius, Tony (August 30, 2018). "Update on Opportunity Rover Recovery Efforts". NASA. Archived from the original on November 3, 2018. Retrieved November 30, 2018. ^ a b c "NASA's Opportunity Rover Mission on Mars Comes to End". NASA. February 13, 2019. Retrieved February 13, 2019. ^ "The scientific objectives of the Mars Exploration Rover". marsrovers.nasa.gov. Retrieved 2015-05-25. ^ "Opportunity Update Archive". NASA/JPL. Archived from the original on May 7, 2009. Retrieved May 4, 2009. ^ a b Dvorsky, George (15 February 2019). "The Enduring Mystery of the Martian 'Blueberries' Discovered by Opportunity Rover". Gizmodo. Retrieved 15 February 2019. ^ "NASA – NASA Mars Rover Arrives at New Site on Martian Surface". Nasa.gov. Archived from the original on June 6, 2012. Retrieved July 15, 2012. ^ "Mars Exploration Rover Mission: All Opportunity Updates". nasa.gov. Archived from the original on August 30, 2015. Retrieved January 5, 2017. ^ "Opportunity Updates". Archived from the original on October 18, 2012. Retrieved November 20, 2014. ^ O'Neill, Ian (December 29, 2014). "Mars Rover Opportunity Suffers Worrying Bouts of 'Amnesia'". Web article. Discovery News. Archived from the original on December 30, 2014. Retrieved December 31, 2014. ^ "Opportunity Update Archive, sols 4024–4029, May 20, 2015–May 25, 2015". Archived from the original on August 30, 2015. Retrieved July 2, 2015. ^ a b c d e "Mars Exploration Rover Mission: All Opportunity Updates". mars.nasa.gov. Archived from the original on March 25, 2018. Retrieved February 10, 2018. ^ a b Opportunity Rover Still Silent on Mars, 4 Months After Epic Dust Storm Began Archived October 15, 2018, at the Wayback Machine. Mike Wall, Space.com. October 12, 2018. ^ Torbet, Georgina (January 26, 2019). "NASA makes last-ditch attempt to revive dormant Mars rover Opportunity". digitaltrends.com. Designtechnica Corporation. Retrieved January 27, 2019. Now NASA scientists are trying a last-ditch attempt to contact the rover based on three unlikely but possible scenarios: that the rover's primary X-band radio has failed, that both the primary and secondary X-band radios have failed, or that the rover's internal clock has become offset. The team is commanding the rover to switch to its backup X-band radio and to reset its clock to counteract these possibilities. ^ Bean, Keri (2019-02-12). "Tonight is the final planned attempt to contact Opportunity. I had the extreme privilege to be the final Tactical Uplink Lead yesterday. My signature is in pink on the command approval form, as usual. Godspeed, Opportunity. #LoveYouOppy #OppyPhoneHome #WakeUpOppy". @PlanetaryKeri. Retrieved 2019-02-16. ^ "Mars Exploration Rover Mission: All Opportunity Updates". mars.nasa.gov. Archived from the original on March 25, 2018. Retrieved February 10, 2019. ^ Oppy, Spirit and (February 12, 2019). "#OppyPhoneHome Update Tonight, we'll make our last planned attempts to contact Opportunity. The solar-powered rover last communicated on June 10, 2018, as a planet-wide dust storm swept across Mars". ^ Chang, Kenneth (February 13, 2019). "NASA's Mars Rover Opportunity Concludes a 15-Year Mission". The New York Times. Retrieved February 13, 2019. ^ Berger, Eric (February 13, 2019). "Opportunity did not answer NASA's final call, and it's now lost to us". Ars Technica. ^ "MERB Notebook - Opportunity Mars Rover data". an.rsl.wustl.edu. Retrieved 2019-02-18. ^ "Opportunity's last tau was 10.8; what does that mean and how is tau defined and measured?". Space Exploration Stack Exchange. Retrieved 2019-02-18. ^ "Martian 'Perseverance Valley' in Perspective (Vertical Exaggeration) – NASA's Mars Exploration Program". Mars.nasa.gov. Retrieved September 7, 2018. ^ "Mars Exploration Rover Mission: Science". nasa.gov. Archived from the original on August 24, 2011. Retrieved July 26, 2008. ^ Chang, Kenneth (November 7, 2004). "Martian Robots, Taking Orders From a Manhattan Walk-Up". The New York Times. Retrieved April 9, 2009. ^ Squyres, Steve (2005). Roving Mars: Spirit, Opportunity, and the Exploration of the Red Planet. Hyperion Press. pp. 113–117. ISBN 978-1-4013-0149-1. ^ "MER – Batteries and Heaters". Jet Propulsion Laboratory. NASA. Archived from the original on October 18, 2012. Retrieved August 13, 2012. ^ Venkatraman, Vijaysree. "The space roboticist". Science magazine. Retrieved February 14, 2019. ^ mars.nasa.gov. "Mars Exploration Rover". mars.nasa.gov. ^ a b "Mars Exploration Rover Mission: Technology". nasa.gov. Archived from the original on December 28, 2016. Retrieved January 5, 2017. ^ "Mars Exploration Rover Mission: All Opportunity Updates". nasa.gov. Archived from the original on February 1, 2017. Retrieved January 5, 2017. ^ a b c mars.nasa.gov. "Mars Rover Opportunity Busy Through Depth of Winter – Mars News". nasa.gov. Archived from the original on July 26, 2016. Retrieved January 5, 2017. ^ a b c "Europe's ExoMars mission arrives in the middle of dust season". phys.org. Archived from the original on November 30, 2016. Retrieved January 5, 2017. ^ NASA’s Opportunity rover is in a deep sleep on Mars — but there's hope it will wake up again Archived June 14, 2018, at the Wayback Machine. Loren Grush, The Verge. June 13, 2018. ^ Malik,SPACE.com, Tariq. "As Massive Storm Rages on Mars, Opportunity Rover Falls Silent". Scientific American. Archived from the original on June 13, 2018. Retrieved June 13, 2018. ^ "All Opportunity Status Updates". Archived from the original on August 30, 2015. Retrieved July 1, 2015. ^ Harwood, William (July 8, 2003). "Opportunity launched to Mars". SPACEFLIGHT NOW. Archived from the original on January 25, 2016. Retrieved December 18, 2015. ^ "JPL.NASA.GOV: Mars Exploration Rovers". www.jpl.nasa.gov. Archived from the original on June 9, 2017. Retrieved February 18, 2018. ^ "Mars Exploration Rover Mission; "Like Rover, Like Asteroid"". Archived from the original on May 11, 2008. Retrieved June 9, 2008. 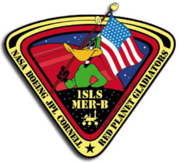 ^ "Space Shuttle Challenger Crew Memorialized on Mars". Archived from the original on June 16, 2008. Retrieved July 24, 2008. ^ a b Webster, Guy; Brown, Dwayne (July 28, 2014). "NASA Long-Lived Mars Opportunity Rover Sets Off-World Driving Record". NASA. Archived from the original on July 28, 2014. Retrieved July 29, 2014. ^ a b Knapp, Alex (July 29, 2014). "NASA's Opportunity Rover Sets A Record For Off-World Driving". Forbes. Archived from the original on July 31, 2014. Retrieved July 29, 2014. ^ "The First Martian Marathon – NASA Science". science.nasa.gov. Archived from the original on May 18, 2015. Retrieved May 15, 2015. ^ mars.nasa.gov. "Streaks on Opportunity Solar Panel After Uphill Drive – NASA's Mars Exploration Program". ^ Truong, Brian. "Mars Exploration Rover". nasa.gov. Archived from the original on November 10, 2013. Retrieved November 20, 2013. ^ "Opportunity Rover Celebrates 5,000 Days on Mars". Archived from the original on February 17, 2018. Retrieved February 17, 2018. ^ "Opportunity's View in 'Botany Bay' Toward 'Solander Point'". NASA. Archived from the original on August 6, 2013. Retrieved August 14, 2013. ^ mars.nasa.gov. "Mars Exploration Rover Mission: Press Release Images: Opportunity". nasa.gov. Archived from the original on December 2, 2016. Retrieved January 5, 2017. ^ Webster, Guy; Cantillo, Laurie; Brown, Dwayne (June 16, 2017). "Martian Crater Provides Reminder of Apollo Moonwalk". NASA. Archived from the original on June 17, 2017. Retrieved June 16, 2017. ^ "Catalog Page for PIA21497". photojournal.jpl.nasa.gov. Archived from the original on August 19, 2018. Retrieved September 7, 2018. ^ "Mars Exploration Rover". mars.nasa.gov. ^ Staff (19 February 2019). "Opportunity: All 228,771 Raw Images". NASA. Retrieved 19 February 2019. ^ Margolis, Jacob (16 February 2019). "How A Tweet About The Mars Rover Dying Blew Up On The Internet And Made People Cry". LAist. Archived from the original on 17 February 2019. Retrieved 17 February 2019. ^ Georgiou, Aristos (February 18, 2019). "No, the Last Words of NASA's Opportunity Rover Weren't 'My Battery Is Low and It's Getting Dark'". Newsweek. Retrieved February 18, 2019. Wikimedia Commons has media related to Mars Exploration Rover.